I've been getting in a lot more than the required ten minutes for the Ten Minute Challenge during the past few days, but I'm still not making very much progress on the antique black border. I found I needed to fill in a lot more grass under the horse, so I planted a few little wildflowers, too. 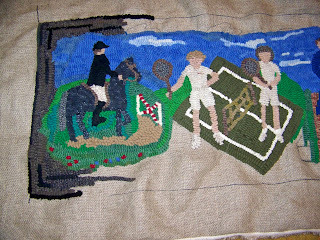 That's one thing that's nice about working on my own pattern, I can change anything anytime without any qualms - but, at the same time, that need for change is a bad thing about working on my own pattern and finding I haven't planned very well - but, the truth is, I like hooking grass and flowers a lot more than I like hooking border. 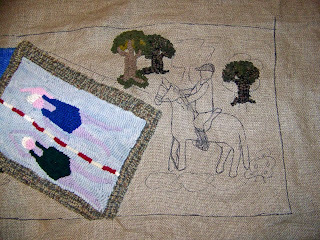 I wanted to cut down on the amount of border at the far end, where I'm still holding off on hooking the final motif, so I hooked in some trees. I suppose I'm thinking about the apple orchard next to my outdoor riding arena because we didn't ride near an orchard when I rode with the Grasshoppers. I think I'll change the horse and rider to western. We used to ride English, hunt seat that is, for our weekly lessons, but whenever we could, we rode again on the weekend at a western stable. There was one stable in particular that we rented from for years, even though they moved almost annually to new run-down farms on the outskirts of the city. They ended up at a farm not too far from where I live now and I went there to buy my first horse - and ended up with two horses. The cowboy who owned the stable was quite a horsetrader. I picked out a small bay horse and the cowboy insisted he couldn't be separated from his "brother", a medium size gray. When I went back a week later to pay for the horses, the gray brother had disappeared and now the bay had a big palomino brother and they couldn't be separated. The palomino proved the truth of that lie by jumping over the hitching rail he was tied to when I tried to ride the bay out of the stable yard. He was caught halfway over the rail, teetering back and forth wildly. The rail had to be sawed apart to get him down. So, I took those two horses home. Named them Millard and Thunder. Anyway, I think I'll make the horse bay and put western tack on him. I think you are doing a fine job on the border!. The whole project is a delight. That comment makes the boring border hooking a lot more fun!